Dallas has a high concentration of temples and churches that range from historic to new constructions. With the shared goal of teaching biblical messages as well as inspiring congregation members, regardless of denomination or age, all houses of worship can highly benefit from custom stained glass. Stained glass has always been a historical means of teaching the illiteral about different religions, providing modern-day symbolism and imagery that become very meaningful for clergy and flock members alike. Singapore is renowned for so many incredible things from being one of the world’s largest business hubs to the most amazing street food. No wonder tourists love visiting this highly urbanized, cultural melting pot. Most people don’t know that Singapore actually houses some of the most beautiful stained glass! 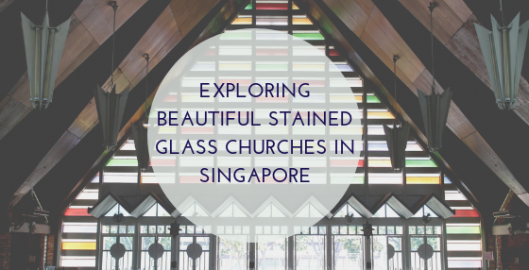 The stained glass found in Singapore churches definitely have a style of their own and only date back to the 1800s at most. With a more modern take, these stained glass collections should be visited by any stained glass enthusiast or art lover. Businesses throughout the Dallas area are always looking for great ways to improve branding efforts in order to really make their commercial property stand out. Increasing foot traffic and attracting new customers is always pertinent to any business model, making visual marketing efforts top priority for many business owners. With so many different options available, finding the right one may seem difficult. Custom stained glass provides a diverse medium that can be utilized for effective visual marketing efforts while enhancing the theme and decor of your business. 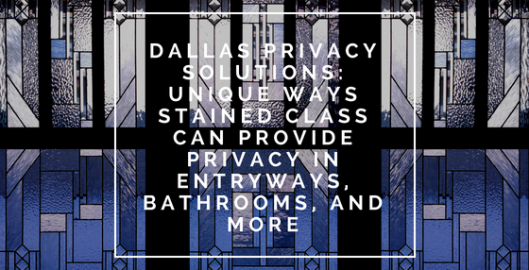 Many Dallas homes experience privacy concerns that can make day-to-day life uncomfortable. Privacy issues within a home ultimately doesn’t allow you to relax and really enjoy yourself, causing severe problems for you and your loved ones. Finding a capable privacy solution that doesn’t eliminate natural light or look tacky may seem impossible. Stained glass delivers a comprehensive privacy solution that addresses all these issues in addition to offering full creative direction for every homeowner. 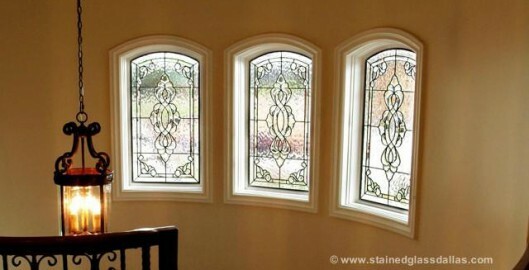 Stained Glass Dallas loves recreating famous stained glass pieces for our Dallas customers. From customized colorful, traditional stained glass to contemporary, leaded glass pieces, we embrace every style and design possible. 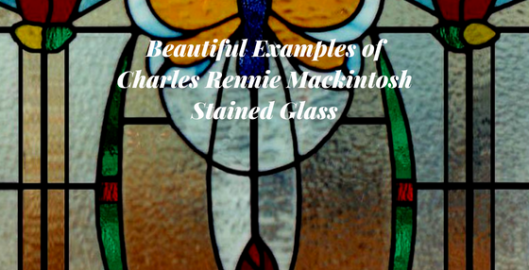 One of our favorite stained glass inspirations is Charles Rennie Mackintosh. Charles Rennie Mackintosh was a Scottish architect and artist that promoted his very own stained glass style in addition to famously designing every detail of several homes inside and out. Dallas homes are always in need of a privacy solution. Homeowners agree that it can extremely difficult finding a proper privacy solution that doesn’t sacrifice natural light. Window coverings can often look tacky and bulky and don’t let a lot of natural light in. Stained glass is the perfect privacy solution for Dallas homes, offering numerous design choices that compliment any theme or interior design your home may already have. 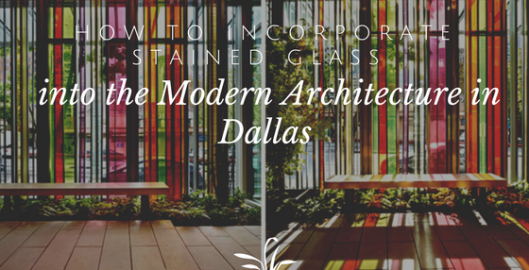 Stained Glass Dallas is proud to have created hundreds of custom, modern stained glass pieces for homes and commercial buildings throughout the Dallas area. Our creative stained glass artisans have accomplished many modern pieces that compliment the contemporary architecture found in our community. Stained glass can sometimes be associated with traditional, outdated art reflecting strong symbolism, powerful imagery, and different art movements that have come and gone. Stained glass has been incorporated in so many different innovative ways, repurposing this medium to showcase the appreciated modern look so many people appreciate in 2018. With so many design options and applications, the sky really is the limit. 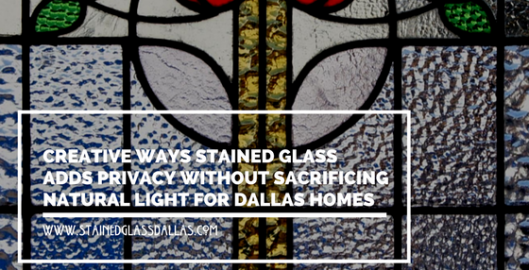 Have you considered residential stained glass in Dallas TX? If so, we would love to tell you about our gorgeous custom designed product. 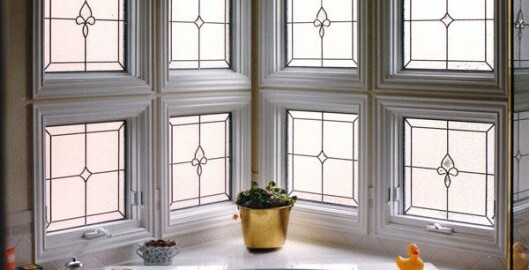 We make hand crafted stained glass windows, doors, and other stained glass accents. In Dallas, custom stained glass is definitely the way to go if you are looking for the styles that perfectly complement your individual tastes and your home’s décor. When you work with Stained Glass Dallas, you have the opportunity to collaborate with one of our designers on your perfect stained glass designs. And each of our stunning stained glass windows or doors is hand crafted by local Dallas artisans. In Dallas, stained glass is used to make a beautiful statement, add privacy, add elegance and class, add value, distinctiveness and aesthetic appeal, and much more. In a home in Dallas, stained glass can become a focal point or the feature that ties together the décor. It can be that final finishing touch that takes a room from well decorated to incredible. Our custom stained glass designs are created to suit each client’s tastes as well as complement the décor and period of the room they will be installed in. 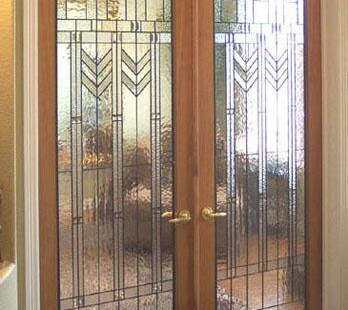 Residential stained glass in a home’s entryway can completely alter the look of the front of the home, giving a uniquely elegant flair to the home and an impressive first impression to anyone coming to the house for the first time. In Dallas, stained glass is simply stunning in a home’s hallway or stair well windows, kitchen windows, or any doors in the home for an incredible style infusion. We even create custom stained glass window designs for Dallas basement windows, to block an ugly view or add some privacy without blocking any of the precious light. In a business in Dallas, stained glass also can make an important statement. Our custom leaded and beveled stained glass designs can add privacy and class to any office or chic salon. Our more vibrant custom stained glass can be used as a bar’s backdrop, a shop’s front window or door, or even as a sign incorporating the name of the business into the design. For a hotel, resort, or convention or conference space, stained glass can make a major statement in a skylight or ceiling, or just in a massive set of double doors. Of course, for a church or other house of worship in Dallas, stained glass windows are part of a long standing tradition stretching back hundreds of years. Stained glass adds inspiration and exquisite beauty to the experience of worship, which is why it is still popular all around the world. Speaking of churches, in Dallas stained glass windows can be quite old and perhaps in need of either repair or a full restoration. Here at Stained Glass Dallas we have extensive experience in restoration of antique religious stained glass. We urge clients to contact us at the first sign that their stained glass windows are sagging, bowing, or have cracked or falling pieces of glass. 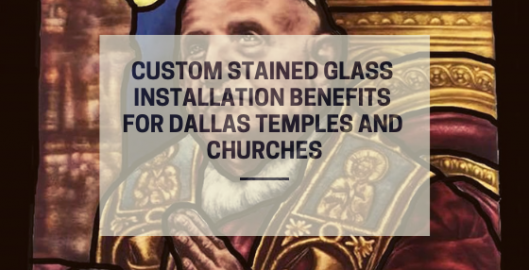 For more information about our Dallas stained glass custom designs, we hope that you will give us a call today or contact us via our convenient online form. We look forward to collaborating with you on a custom designed and hand crafted stained glass window or door that perfectly suits your needs and your style.